Last week I read an article on Man Repeller about millennials and brand loyalty. In the era of fast fashion and accessible trends, Gen Y/Gen Z was becoming more and more focused on the garment than the label. But now, after Gucci's notably anti-fast fashion runway show, it seems that we millennials are gravitating back towards the glories of brand loyalty. To say the least, I am overjoyed with the shift. From my earliest shopping days I have been inspired by brand loyalty and feeling like I was a self-appointed ambassador of my favorite brands. Nowadays, instead of casually explaining to my friends that I only buy [insert brand name] sunglasses or [insert another brand name] t-shirts I can wax poetic about my favorite companies by writing about them on this little ol' blog. Daydream Prints recently released its new collection of greeting cards and bridal accessories so I'm going to take a minute and partake in the newest trend of brand loyalty by rambling about one of my favorite stationary companies. I send an overwhelming amount of snail mail for someone who barely knows what life was like pre-internet. Throughout high school I communicated with my best friends via stationary and parchment paper despite having a cellphone. In elementary school, I regressed from texting to emailing which, now that I think about it, is very weird for a 10 year old to do. And now, almost 10 years later I've regressed even further, forgoing the instantaneous iMessage for the extraordinary world of greeting cards. 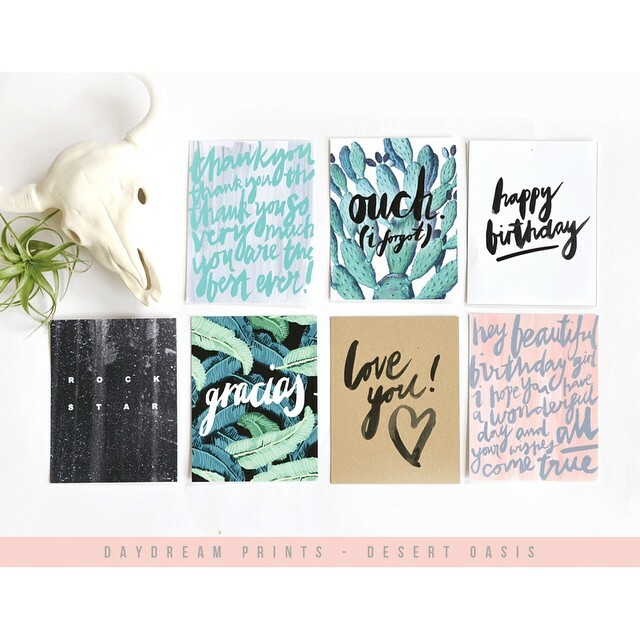 Daydream Prints's greeting cards range from water colored condolences to poetic love notes as well as new designs featuring beachy palm leaves and sisterhood quotes that I can only imagine would be great for Big-Little/Sorority Sister events in the fall. I already have an array of hand designed Christmas cards from Daydream Prints, and I have been obsessed with their Love Letter greeting cards since day one. Now that there's even more styles to choose from I really love the "Find Your Tribe" design that was just released as well as the simple Happy Birthday w/Hugs and Kisses and Thank You cards that were released earlier this year. Some of them are a little too pretty to send away, but the sentiment is still there. If nothing else, each card serves a convenient art print that would look really pretty over my (your?) work desk. There are so many patterns available so in the day and age when digital communication is the only way people communicate, do a real life throwback and order a few Daydream Prints greeting cards to send to your family and/or friends for that special occasion. Or, ya know, just buy a couple for your viewing pleasure. Me too! Thanks for commenting, Midnight Cowgirl.